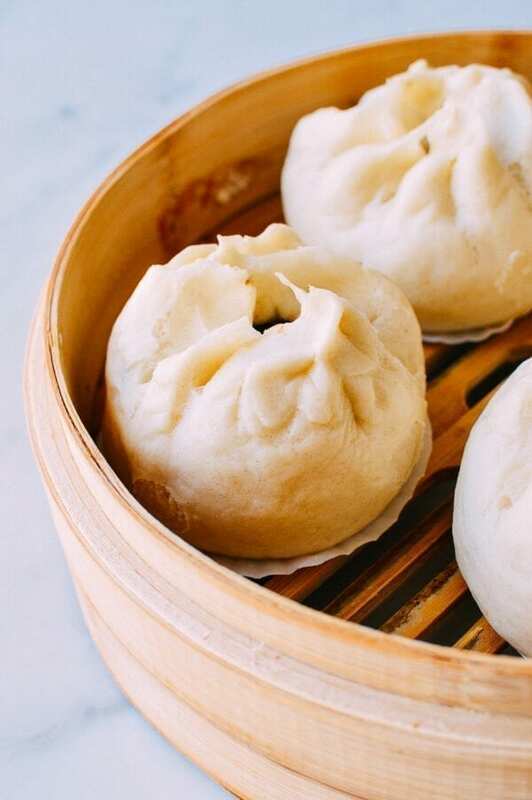 Our baked cha siu bao is to this day one of the recipes that consistently stays at the top of our “most popular” list––a strong indication of just how much people love these tasty BBQ pork buns but you must try these steamed bbq pork buns. 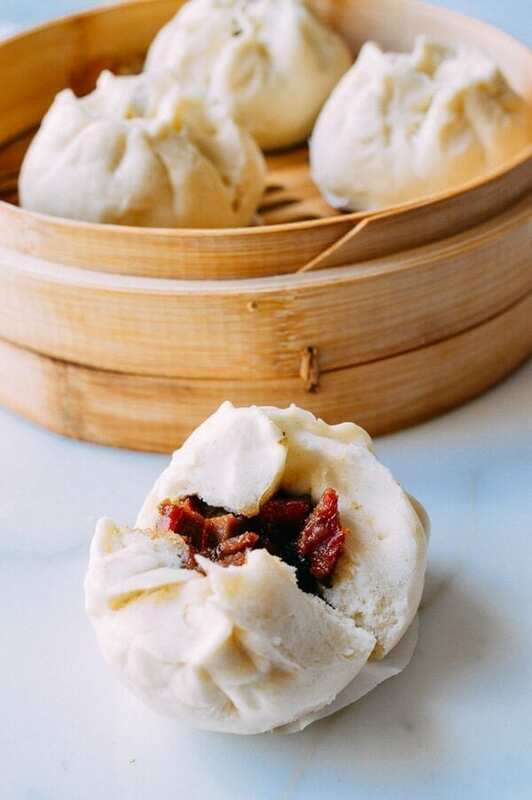 For this reason, steamed BBQ pork buns or Char Siu Bao, also called steamed roast pork buns have been on our to-do list for a long, long time. We’ve had lots of questions from readers on how to make steamed buns, and for good reason. 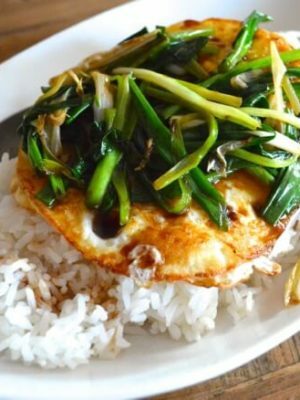 This great variation is a super star on dim sum tables, enjoyed by people of all ages. But I wasn’t going to just throw it together; we have high standards here. Like our Milk Bread recipe, I’ve been on the hunt for a perfect steamed bun recipe for a long time. The perfect steamed BBQ Pork bun is snowy white and cracked open at the top. 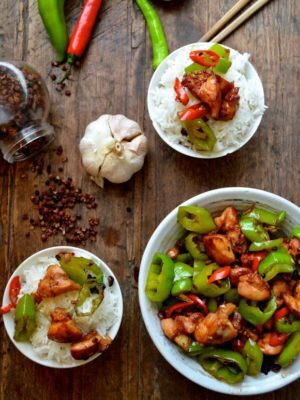 Check out our Chinese Roast Pork Cha Siu recipe to make your own filling! The dream would be having a friend who worked at a Chinese Bakery or dim sum restaurant who could tell me how it was done, but that would be too easy. After much research, I finally found a steamed bbq pork buns recipe in Chinese that worked after some testing and tweaking. Now I know that the key to a pull-apart, snowy white bun is actually cornstarch, and that baking powder helps crack open the tops. 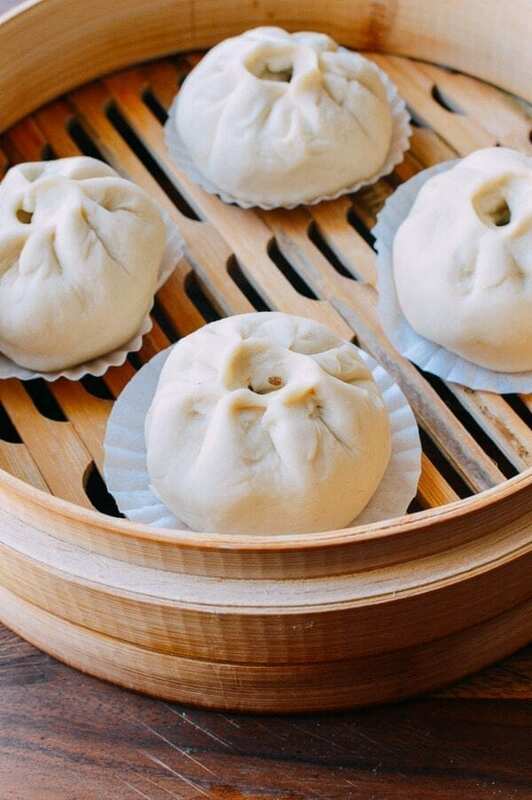 Unlike other steamed buns, which usually start with cold water and are steamed over medium heat, these buns require you to pre-boil the water in the steamer, forcing the buns to rise quickly so the top cracks. Pretty cool stuff, I have to say! How satisfying it is to be able to finally crack open the secret to a mystery. 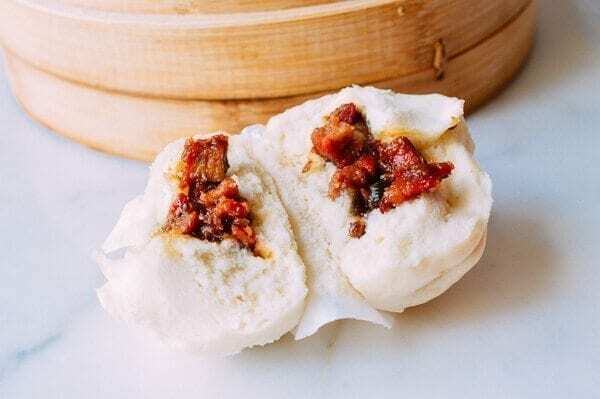 While the dough is resting, let’s make the meat filling for these steamed bbq pork buns. 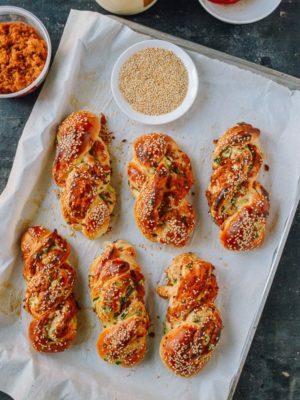 We’re using a recipe similar to the BBQ pork filling recipe we made for the baked version of these buns. The quantities are adjusted for the amount of dough in this recipe. Heat the oil in a wok over medium high heat. Add the onion and stir-fry for a minute. 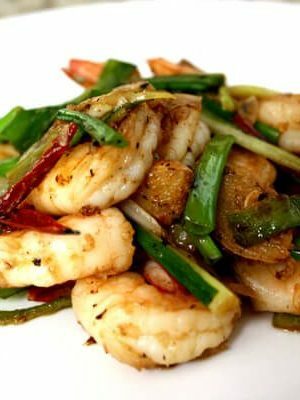 Turn heat down to medium-low, and add the sugar, soy sauce, oyster sauce, sesame oil, and dark soy. Stir and cook until the mixture starts to bubble up. Add the chicken stock and flour, cooking for a couple minutes until thickened. Remove from the heat and stir in the roast pork. Set aside to cool. If you make the filling ahead of time, cover and refrigerate to prevent it from drying out. After your dough has rested for 2 hours, add the baking powder to the dough and turn the mixer on to the lowest setting. At this point, if the dough looks dry or you’re having trouble incorporating the baking powder, add 1-2 teaspoons water. 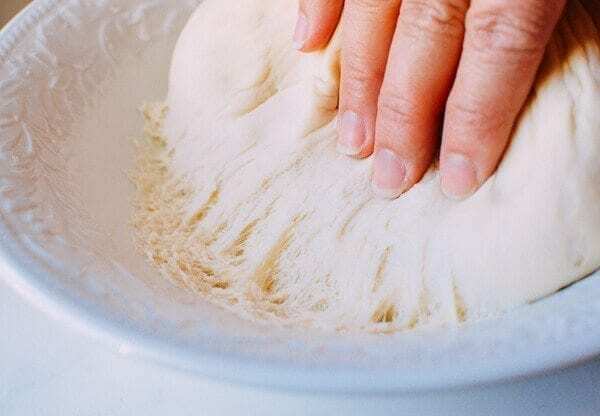 Gently knead the dough until it becomes smooth again. Cover with a damp cloth and let it rest for another 15 minutes. In the meantime, get a large piece of parchment paper and cut it into ten 4×4 inch squares. You can also use paper cupcake liners, flattened out. Prepare your steamer by bringing the water to a boil. Now we are ready to assemble the buns: roll the dough into a long tube and divide it into 10 equal pieces. 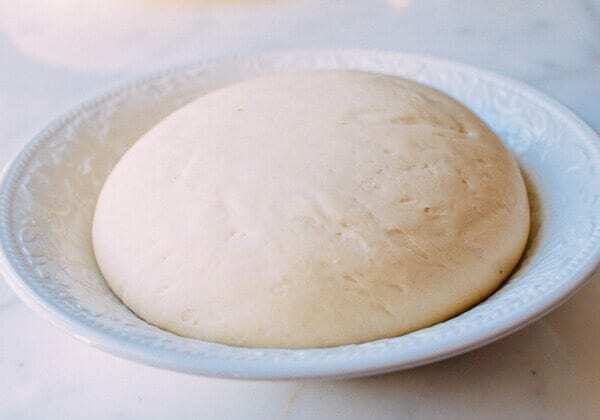 Press each piece of dough into a disc about 4 1/2 inches in diameter (it should be thicker in the center and thinner around the edges). Add some filling and pleat the buns until they’re closed on the top. (Check out our video of this pleating technique in our Carrot Ginger Pork Bun Post). Place each cha siu bao bun on a parchment paper square, and steam. 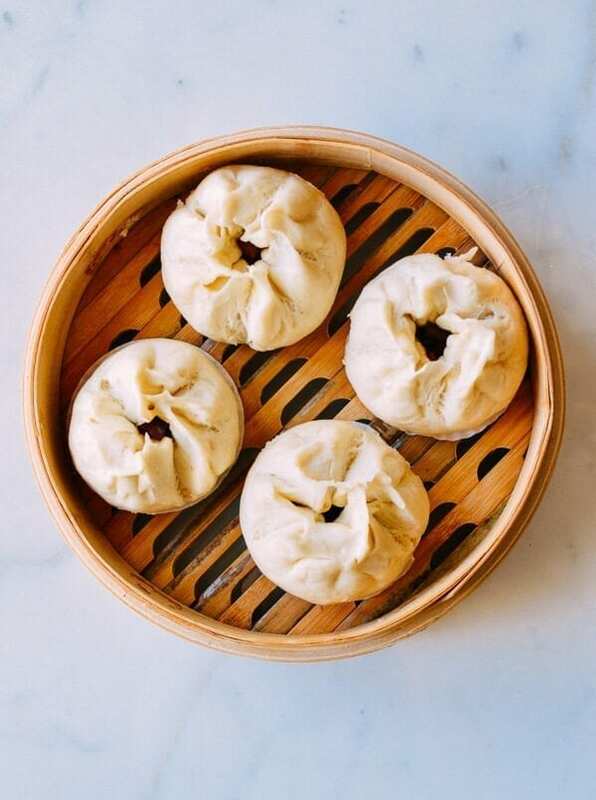 I steamed the buns in two separate batches using a bamboo steamer (be sure the boiling water does not touch the buns during steaming process). 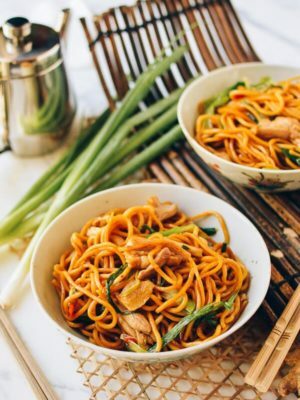 If you need a steamer rack, multi-level metal steamer, or better yet, a nice set of Bamboo steamers, check out some recommendations on our Chinese Cooking tools page and buy the same tools we use in our kitchen! You should also see our post on how to set up a steamer if you’re not familiar with steaming foods in Chinese cooking. Once the water boils, place the buns in the steamer and steam each batch for 12 minutes over high heat. Serve your steamed bbq pork buns hot! While the dough is resting, make the meat filling. Heat the oil in a wok over medium high heat. Add the onion and stir-fry for a minute. 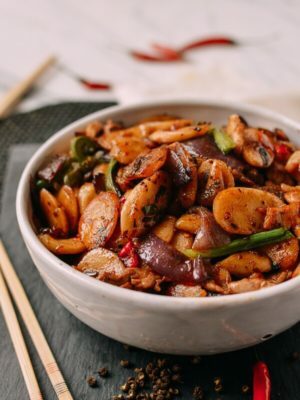 Turn heat down to medium-low, and add the sugar, soy sauce, oyster sauce, sesame oil, and dark soy. Stir and cook until the mixture starts to bubble up. Add the chicken stock and flour, cooking for a couple minutes until thickened. Remove from the heat and stir in the roast pork. Set aside to cool. If you make the filling ahead of time, cover and refrigerate to prevent it from drying out. After your dough has rested for 2 hours, add the baking powder to the dough and turn the mixer on to the lowest setting. At this point, if the dough looks dry or you're having trouble incorporating the baking powder, add 1-2 teaspoons water. Gently knead the dough until it becomes smooth again. Cover with a damp cloth and let it rest for another 15 minutes. In the meantime, get a large piece of parchment paper and cut it into ten 4x4 inch squares. Prepare your steamer by bringing the water to a boil. Now we are ready to assemble the buns: roll the dough into a long tube and divide it into 10 equal pieces. 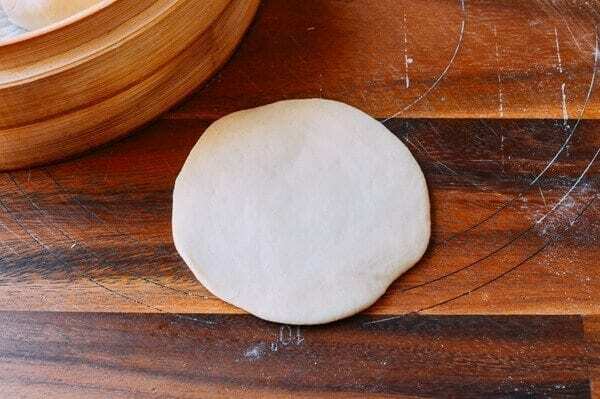 Press each piece of dough into a disc about 4½ inches in diameter (it should be thicker in the center and thinner around the edges). Add some filling and pleat the buns until they're closed on top. Place each bun on a parchment paper square, and steam. 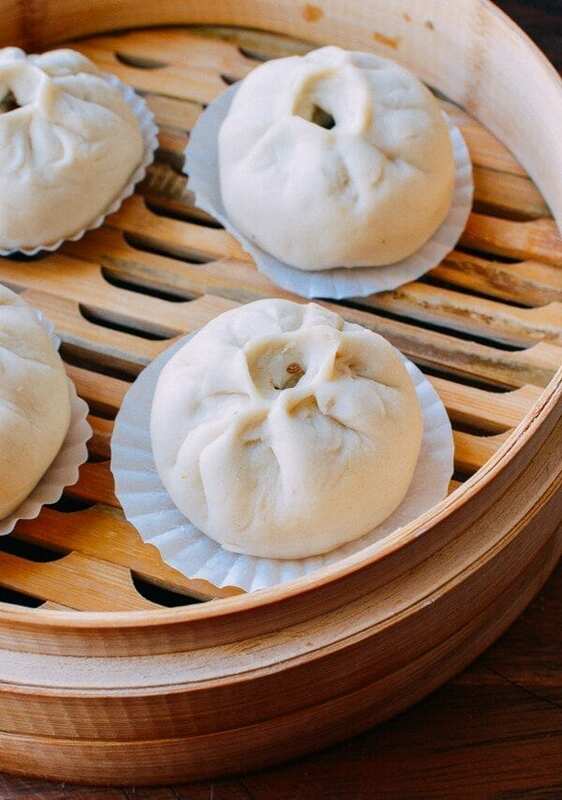 I steamed the buns in two separate batches using a bamboo steamer (be sure the boiling water does not touch the buns during steaming process). Once the water boils, place the buns in the steamer and steam each batch for 12 minutes over high heat. 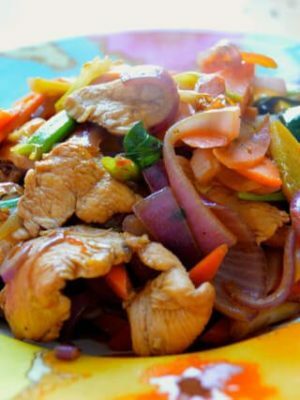 I love your site – I’ve tried several recipes here now and they all cane out delicious! I made these pork bao buns and they were delicious – exactly like I remember them! I was cooking for a large group of people and making a few other things too, so I made them half the size so I could serve 20 instead of 10, and they still came out perfectly! The recipe was perfect! I had tried others but just the buns turned out chewy etc. This was better than store bought, no bragging!! Thanks for posting. Yeahhhh, love it. Thank you for your comment, Mary Lee. Incredible! I never thought I could make these at home, but they turned out so good. My folding needs practice and I made them too big at first, but I’ll get there. I did add some 5 spice powder to your BBQ pork recipe as it reminded me of the ones I used to get in Hong Kong when I lived there. How wonderful, Joseph! 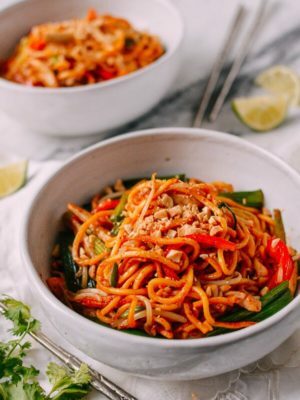 Thank you for trying out our recipes. My son and I made these last night with some leftover char siu I had made a few days before. Delicious! I have one question– our bao were not as light and airy as those we’ve had from our favorite dim sum places. We followed the recipe. Any ideas about what we may have done wrong (or could do better next time)? 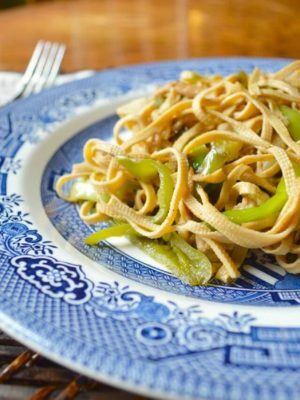 Tonight, Shanghai fried noodles… Can’t wait. 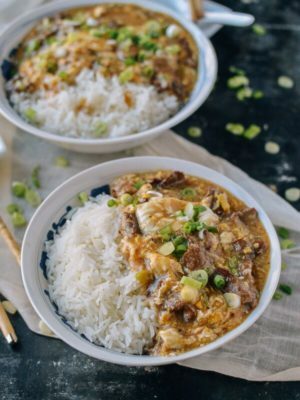 I’ve been telling everyone I know who loves to cook Chinese food about your site. Hi Camille, it’s important to make sure the dough proofs properly. It may take longer sometimes, but the dough must proof correctly in order to create fluffy buns. 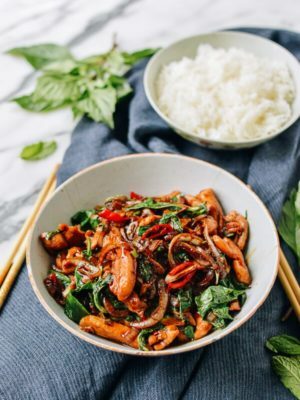 And thank you so much for sharing our site with your friends, so more people can find out for themselves that Chinese cooking is really not difficult! Add sugar and let it sit for 10 min but your instructions didn’t say anything about proofing so hopefully it comes out good ! Sounds awesome Jen! 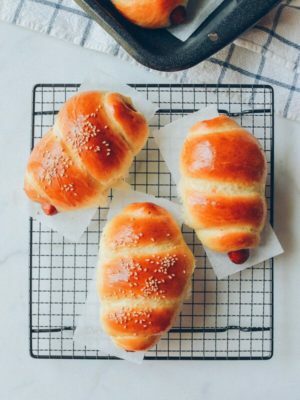 Try Judy’s recipe for the nai wong custard bao here! 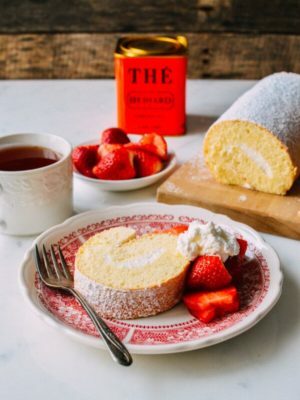 Hi, a great recipe. Thanks a lot! I think I followed every step and the result really was amazing. Although I have one issue with the optics: all my Baos have several little brown spots on the outside. Do you have an idea what the cause is? Thanks! Hi Tom, that’s caused by a little too much yeast and/or baking powder, you can try reducing both by 10% next time. Hello Judy, thanks a lot for the hint. I will try that the next time. If freezing, should I freeze them before steaming or after? Or is it best to make a traditional bamboo set?